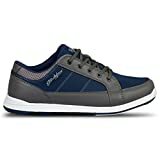 This Strikeforce Men's Spartan bowling shoes offers lasting comfort and a great fit with its Komfort-fit construction. It helps your feet deliver a smooth and steady release, while its classic design is perfect for any bowler. Ballistic mesh upper for added ventilation and comfort.. Komfort-Fit construction.. Komfort-Fit construction..
Non-marking rubber outsole.. #8 white microfiber slide pad on both shoes with FlexSlide Technology.. Model Number: M-048.